the enclosure is based on biological principles found in the plate skeleton of sea urchins. the structure combines cutting-edge computational technologies with constructional principles found in nature. the structures, which serve as gathering places and navigational devices, reference the baobab trees of kéré's native west african village of gando, burkina faso. 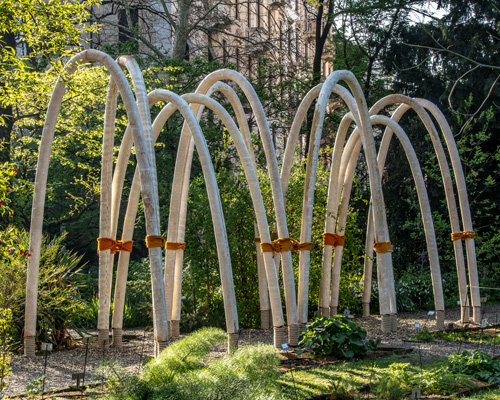 'the circular garden' was grown from soil over the past six weeks – and will be returned to the soil at the end of the month. the 'deceiving object' is described as both receded and expanded, visible and invisible, solid and ethereal. inspired by an ancient marine tradition, three boats will arrive in dubai by sea and then be raised and turned upside down to become the roof of the building. in an effort to convey the current brexit mood, the heart will 'beat' inside the space, inflating and pushing visitors outside. the design is an abstraction of the smallest 'nano' living unit currently available on the market, which is around 160 sq ft.
the design seeks to capture everyday elements fundamental to hong kong's urban fabric. the hypnotic universe of canadian singer-songwriter KROY serves as influence for this performative installation, an investigation in music, architecture, video and photography. by using white sails intertwined within the wooden structure, the project symbolizes sailboats gathering at harbor. the guests of honor, lyndon neri and rossana hu, discussed their practice and how they approach architecture and design. arguably australia’s most recognized architect, murcutt is internationally respected for his environmentally sensitive and distinctly australian architecture. 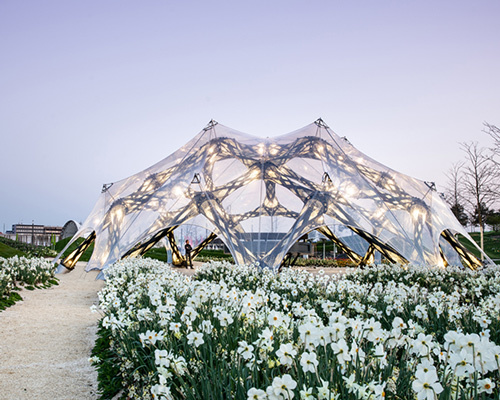 the temporary structure is made by arranging slates to create a single canopy roof that appears to emerge from the ground of the surrounding park. 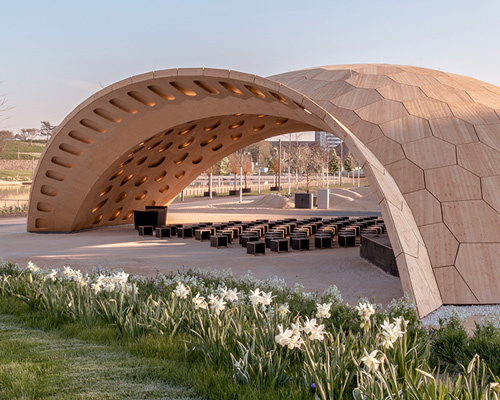 made of FRP (fiberglass reinforced plastic), the 3 loops structure welcomes the visitors with rest and performing areas and provides a key to navigate through the art park. the organic lines and fluid forms of the CLT structure respond to a careful study of the site's numerous trees. 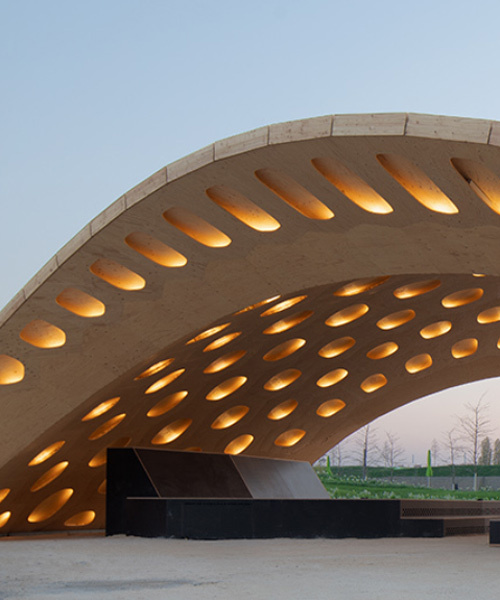 the installation, located at the university campus in the city center, is a double-curved, parametrically designed segmental shell of light, single-curved wood and biocomposite elements, which are supported by three curved crossed wooden beams. the design is part of a year long celebration of the renowned scottish architect charles rennie mackintosh. 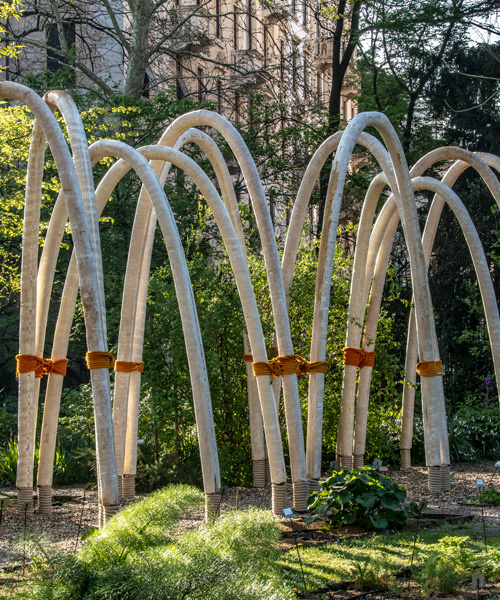 I-CONO is a temporary pavilion that was built by bianchimajer and anna merci in occasion of the festival de arquitectura y ciudad méxtropoli 2018.
the pavilion will be built in front of the OMA-designed garage museum of contemporary art in moscow. the project presents a series of sculptural play installations influenced by the wildlife of the krkonoše national park. 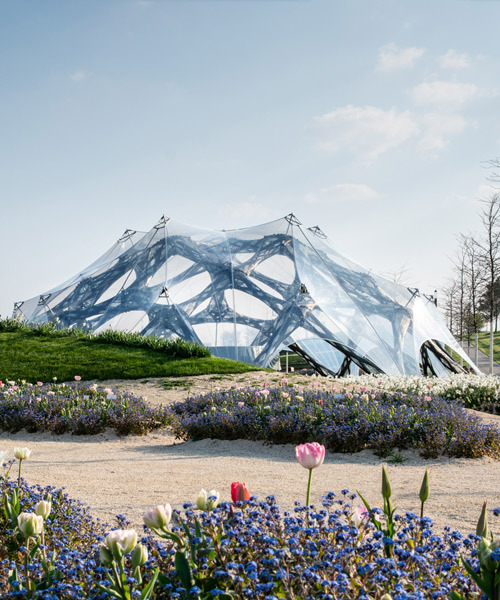 the structures would provide an unprecedented outdoor meeting place for citizens, connecting and bonding the, with nature, city, and sea through strategic allocation. the design of the installation is a complex composition of simple cubes interestingly arrayed in the urban fabric. 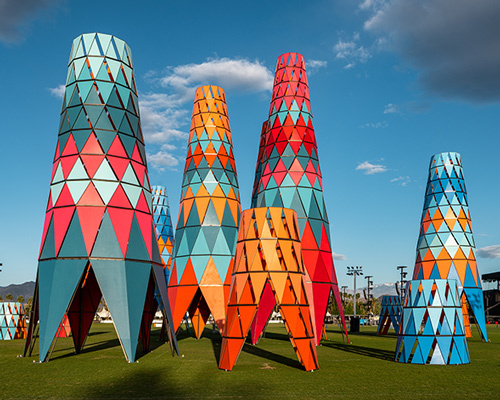 we continue our annual review of the year's big stories with a look at the diverse array of temporary structures that caught our eye over the past 12 months. 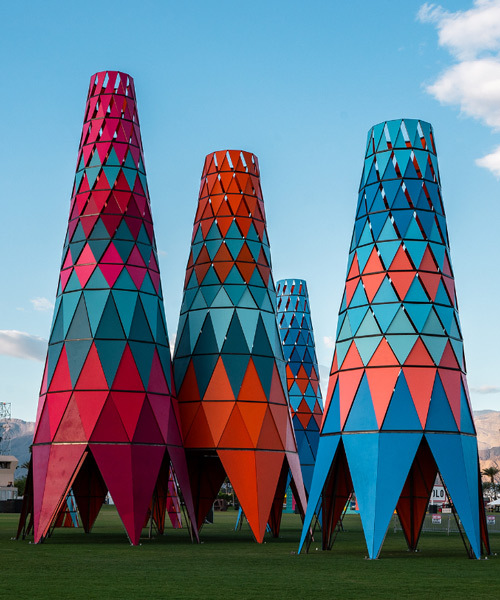 presented by audemars piguet and art basel, ‘albedo’ is an atmospherically-attuned installation that allows for daily aerosolar performances and solar cooking sessions. uneven sections create a dynamic and expressive composition that brings a slight ripple into this seemingly austere shape. this sculptural piece generates an inverted topography that is supported by 6 rammed earth walls representing the 6 brazilian biomes.